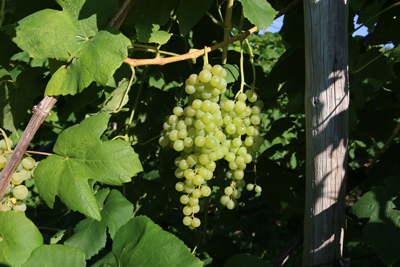 A white table grape, Himrod was a cross between the popular Thompson Seedless and Ontario and released in 1952 by the New York Agricultural Experiment Station in Geneva, New York. Seedless, Himrod is known for ripening quickly and its sweet, delicate flavor. Ripening the first week in September, this is the grape used in Fulkerson Winery’s “Matinee” wine. Fermented dry, Himrod can taste of ginger, while if only fermented part-way through, it can taste like kiwi and lime. The Thompson Seedless and Ontario Cross was a very successful one, which resulted in the eventual release of three other cultivars; Interlaken, Romulus, and Lakemont.